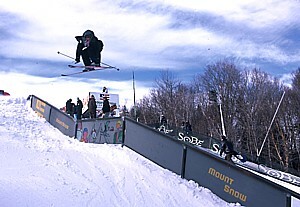 Mount Snow, Vermont, has become the first ski resort to form a partnership with foursquare social network. Mount Snow has entered into a partnership with foursquare, becoming the first ski resort to launch a brand page and badge campaign on the popular social network. Foursquare is a location based mobile platform makes areas easier to explore and provides deals and prizes for users “checking in” to their venues. Foursquare guides real-world experiences by allowing users to bookmark information about venues that they want to visit. Foursquare is rolling its service out to only about 15 ski resorts, with only a few on board at the moment. Out of all the ski resorts in North America, why start with Mount Snow? “Because we’re awesome! (ok, and the foursquare founders are pass holders here),” said Dan Gullotti, Mount Snow Interactive Marketing Manager. In one day 250 people followed Mount Snow, within 48 hours that number jumped to nearly 5000. On Thursday January 20th guests checking in at the main base lodge could visit the Marketing Office and receive a free Carinthia beanie. Specials will be active in Mount Snows various venues, including food & beverage outlets, tubing, retail shops and the naturespa. Bragging rights go to those who are able to unlock the Mount Snow badge but perhaps the biggest battle is for the right to be Mayor, which will include a major perk; a reserved parking spot! Be sure to continually check into Mount Snow venues to unlock specials at Cuzzin’s, Station Tap Room, the Snow Barn, Backside Snowboards and more. To friend Mount Snow on foursquare go to www.foursquare.com/mountsnow. This entry was posted on January 24, 2011 at 4:31 pm and is filed under Vermont skiing. You can follow any responses to this entry through the RSS 2.0 feed. You can leave a response, or trackback from your own site. A ski resort is a resort developed for skiing, snowboarding, and other winter sports. In Europe a ski resort is a town or village in a ski area – a mountainous area, where there are ski trails and other supporting services such as hotels, restaurants, equipment rentals, and a ski lift system. In North America it is more common for ski areas to exist well away from towns, and the term ski resort is used for a destination resort, often purpose-built and self-contained, where skiing is the main activity. .